He may hae gone from our UK shores, but he is certainly not forgotten. 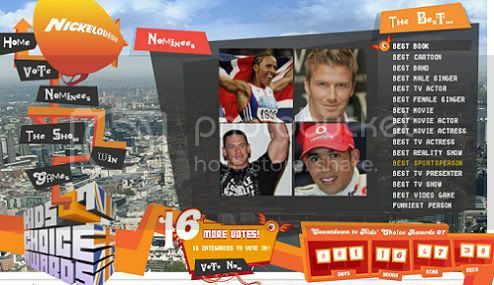 He has been nominated for 'Best Sportsperson' in the UK Nickelodeon Kids' Choice Awards. Versace Says "Don't Believe The Hype"
I was very excited when I read yesterday that Dontella Versace would be designing The Spice Girls stage outfits for their comeback tour. But a spokesperson for Versace killed my dream by announcing this is not the case. "It's simply not true," he told Vogue. "I have no idea where the rumours have come from." It was reported by many fashion journalists that the style-wise the group appeared under-styled and out of tune at their photo call (mostly due to Geri choice of mumsy outfit). I would suggest they get someone huge on board. If not Versace then maybe Dolce & Gabanna. As much as I loved the platform trainers, Mel B's leopard-print catsuits and Geri's Union Jack minis, I don't think it would work a second time around (well maybe just for one song...Wannabee of course). David Beckham will miss his third game in a row tomorrow against FC Dallas. Thankfully he did not travel, so he can stay in LA and work on his recovery. "He just wants to get going," Yallop said. "That's the frustrating part. But he feels a lot better. He's going to start running today or tomorrow. He feels that he can, so that's good." As you can see from the picture above his ankle is still heavily strapped. I hope for David's sake he can get over his injury and get back to want he is itching to do. Play. David and Victoria are named in the 68th annual Vanity Fair's best dressed list, as Best Dressed Couple. David and Victoria are one of just 10 couples named in the annual fashion poll. The magazine names David’s style icon as Steve McQueen and Victoria’s as Audrey Hepburn. The 68th annual best-dressed list was based on a poll of fashion industry experts. The latest edition of Vanity Fair magazine goes on sale on Friday. NO No no...not Lindsay....anyone but Linsday. This is one of the best outfits Victoria has worn this year and now it's tainted with Lohan. Victoria, David and the boys were at the Home Depot Center in Carson for a family day function for the footballers, wives and children. How cute. The boys were dressed in their standard mini-me LA Galaxy kits whereas Mummy Becks looks absolutely amazing in this Pucci dress with another Hermes Birkin bag (serious bag envy). This is one of the best outfits I have seen Victoria in this year. I do wonder how she manages walk on grass with heels. It has been reported that Victoria Beckham has been in discussions with ABC executives with regards to her presenting on ‘The View’. Personally, I do not believe this story. 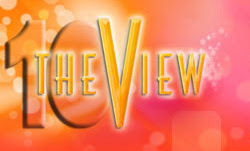 Victoria is based in LA, 'The View' is based in New York being the first major stumbling block. She has the personality for this show, but being from England I don't think she would be able to speak with much authority on the subjects which will be about American things and American people she does not know. Besides I thought Whoopi Goldberg was the front runner for the spot. David Beckham was a surprise inclusion in the Galaxy squad having been categorically ruled by Galaxy head coach Frank Yallop with an ankle injury. David watched from the bench as the LA Galaxy were defeated 2-1 by Chivas Guadalajara in their SuperLiga group match. Second-half goals from Francisco Rodriguez and Omar Bravo gave the Mexican side the victory before Landon Donovan grabbed a late consolation for Galaxy. After the win and high of last week, this must be a bitter disappointment for David and the team. LNB magazine recently posted David Beckham on their 22 July 2007 cover. You would be easily be forgiven for thinking this was a recent photo, but it was first used on the July 2004 issue of Vanity Fair, exactly 3 years ago. The only difference in this photo - shot by Annie Leibovitz - and the Beckham of today is that he now has more tattoo's. Victoria Beckham has been making lots of new friends since she arrived in LA. Her newest best friend seems to be Eva Longoria. Many are commenting that the Victoria and Eva friendship seems more genuine as they are closer in age, and appear to have more in common (shopping, being seen out in public, both have sportsmen as husbands) than Victoria and Katie. The first sign we saw that these two were becoming friends was at David Beckham's first game for LA Galaxy. In the VIP box it was Victoria and Eva sipping champagne, chatting away, while Katie actually watched the game and played with Suri. The following night, Eva went solo to the "Welcome to America" party, but she reportedly hung tight to her new BF Victoria. On July 25, David and Victoria enjoyed lunch with Eva Longoria at the Chateau Marmont in West Hollywood and I am sure this is not the last time we will see them out together. At last night's ABC TCA Party, Ugly Betty Executive Producer Marco Pennette revealed that Victoria Beckham will guest star on the show this season. He wouldn't say much about her role but he did reveal this, "There's a wedding dress involved. There's a wedding involved with her storyline." Ugly Betty star Becki Newton, who plays binge-eating receptionist Amanda, hopes her character clashes with Beckham. She says, "Amanda is going to be like, 'I'm not standing next to Posh because she's too skinny. She's gonna make me look fat.' Amanda's gonna take her down." 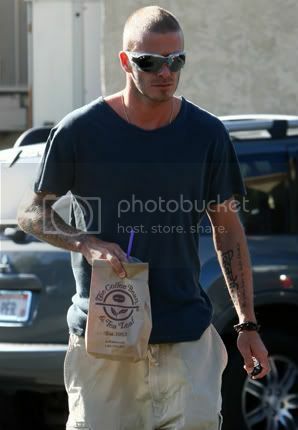 David Beckham showed off his new hair cut while visiting his favourite coffee shop, The Coffee Bean. When David first got the bleach blonde I did not like it, now he has buzzed it off I miss it. Again David does not look too happy, maybe it is because he has been ruled out of the LA Galaxy's match on Saturday against Mexican side Chivas de Guadalajara in the cross-border Superliga competition. David unfortunately still has not recovered from his ankle injury. He is expected to make his Major League Soccer debut at Toronto on Sunday week. The Spice Girls unveiled a new grown-up look as they announced extra dates for their reunion tour. Those of you in Shanghai, Vancouver and San Jose, California will be pleased to know that the Spice Girls have added your cities to their tour. 3 million people have now requested tickets. The Beckham - especially Victoria - sure do love shopping. After Victoria's food shopping jaunt, she met up with David at West Hollywood Boutique H Lorenzos, were they did even more shopping. Both looked a bit miserable, especially David who maybe bored of shopping already. He can't really do anything else since he can't train with his sore ankle. But if you go to any women store in the world, you are bound to find a bored man trailing his wife. They both cheered up when they bumped into 'Hairspray' & Oscar nominated actress Queen Latifah. More Spice Girls Tour Dates? Did David Gamble On His Ankle? Who Wore The Pink Ostrich Birkin Better? How Do You Prefer Victoria Beckham's Hair? Which Dress Should Victoria Wear?